SNMP++v3.x is based on SNMP++v2.8 from HP and extends it by support for SNMPv3 and a couple of bug fixes. SNMP++v3.x is a C++ API which supports SNMP v1/2c/v3. The v3 support of SNMP++ and AGENT++ is provided by courtesy of Jochen Katz (katz07@agentpp.com). These extension have been implemented transparently for the API user, except for the Pdu and Snmp classes which had been modified in order to support SNMPv3. Additionally, the API had been extended by a new Target subclass named UTarget (USM based Target). 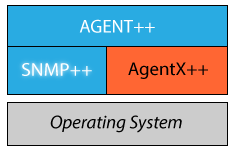 SNMP++ v3.x (and AGENT++ v4.x) can be used with at least Linux, FreeBSD, Mac OS X, Solaris, Windows XP/7/8, and Cygwin.